Hi guys! It's been a busy week for the blog, and we're not done yet. 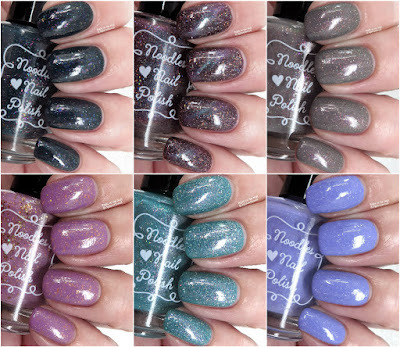 Tonight I've got the Noodles Nail Polish Winter Collection to share with you. This is quite appropriate since so many people are experiencing the Arctic blast hitting the US this week. Please be safe, and make sure to take care of all your pets, too. The set consists of 5 crellies and 1 jelly polish (with a bonus re-release of last year's Eskimo Kiss...Natalie didn't have the recipe anymore, so she recreated it as version 2.0). These will release with the Valentine's Day duo on 2/1/19 at 6:00 PM ET on the new Noodles Nail Polish website. They will retail for $9.50 or $10 depending on the shade (I'll label each with the price below). Enough chatting, shall we get to the good stuff? 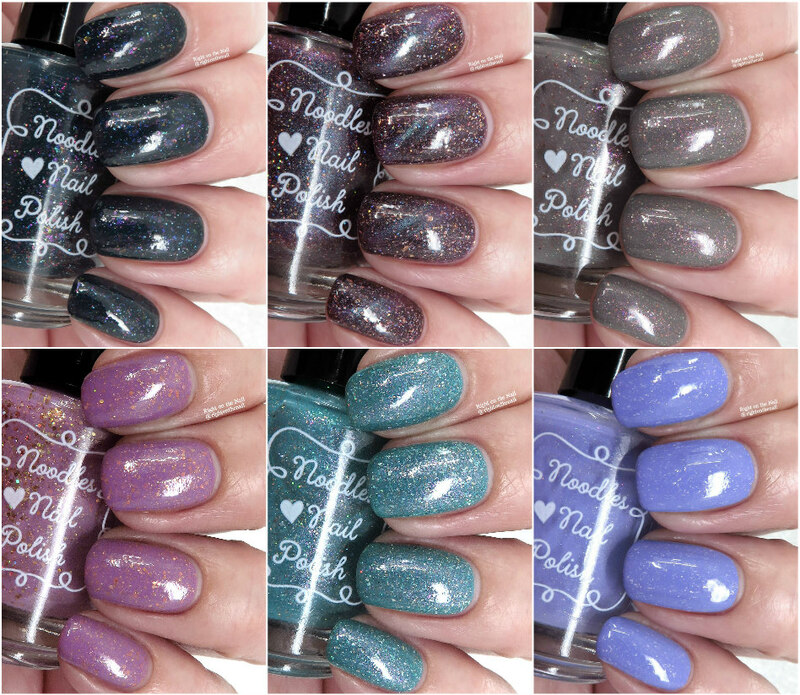 All photos show swatches with 2 coats and a layer of topcoat. Yes, all of these are 2-coaters! I had no issues with the formula for any of these. All of them contain glitter, so they will dry with some texture, so I recommend at least 1 coat of topcoat. If you are especially sensitive to feeling your polish, make sure that topcoat is a thick one, or apply a second coat of a thinner one. I use peel-off basecoats to make removal a breeze. I recommend UNT Ready for Take Off, or Hit the Bottle Keepin' it Peel as they both work well (I am not affiliated with either site or brand...I'm just sharing the love). If you want your polish to last a little longer, I completely understand. In that case, the foil method will work best for you. Starting off, we have Cozy Nights which is a blackened navy crelly base with various types of UCC flakes and blue/pink/gold/silver holo glitters. Make no mistake, this one is definitely blue, but may appear black if you're in low light. I love polishes with a mix of glitter and flakes for extra dimension. This is 2 smooth coats. Unfortunately I don't have version 1.0 to show you, but JodisPolish to the rescue! Click that link to see her video about this month's release. Eskimo Kiss 2.0 is a light grey that leans tape on my warm skintone with copper hexagonal glitter, bronze shimmer and flakes, and a scattered holo finish. It's a work-appropriate shade with some pizzazz. Natalie made a magnetic polish! Thankfully Natalie wrote "Magnetic" on the label so I knew what to do. If I didn't know better, I'd have thought this was just a beautiful multichrome polish. Freezin' Season is a deep plum jelly base with silver and gold flakes, pink/gold/blue holo glitters, and magnetic shimmer that flashes pink or blue depending on the angle. My husband said it best when I showed him my nails: "Those are galaxy nails!" I love that this isn't your plain 'ol magnetic polish. The addition of flakes and glitters makes this one really special. Yes, you will need a magnet to get the effect. If you don't have one, lots of brands or stockists carry them. For example, check out Lantern & Wren for a wide variety of types with good prices. To get the effect, I first applied my base coats and the first coat like normal. I then applied a thicker second coat to a single nail and quickly placed the magnet as close to my nail as possible for at least 45 seconds (or until my hand got tired) before moving on to the next nail. After all nails had 2 coats, I applied a quick-dry topcoat to each nail and placed the magnet over the nail again for about 15 seconds. It sounds like a long process, but it goes pretty fast once you get the hang of it. Yes, another top pick for the collection! Snuggle Weather is a medium grey crelly base with strong fuchsia shimmer, and smaller silver/gold/rose gold glitters. What an interesting mix of grey and pink! I'm constantly impressed with Natalie's ability to create cool color combinations. Warm Woolen Mittens is a medium lilac purple crelly base with copper/gold hexagonal glitters, bronze flakes, and gold/bronze shimmer. This one leans much more pink than yesterday's Once Upon a Time from the Valentine's Day set. See my note above about awesome color combinations. Yup, this is my third top recommendation. I bet you're not surprised. Wintermint is a medium turquoise crelly base with pink to green shifting shimmer, silver/bronze flakes, and silver, copper, and purple holo glitters. I have heart eyes just looking at this one. And last, but certainly not least, we have Worth Melting For which is a bright periwinkle blue crelly base with silver holo flakes, white microflakes, and fine silver glitter. This one works well for a Valentine's Day manicure as well. It was especially opaque and barely needed a second coat. Whew, that was a lot of writing. If you weren't keeping track, my top recommendations are Freezin' Season, Snuggle Weather, and Wintermint. The one thing I was surprised not to find was a white crelly. Although there is no new white crelly in the collection, Mint for Each Other will be re-released as well (you can find my review of it here...it was my first time reviewing any Noodles). Natalie has done it again, folks. These will be available this Friday, February 1st at 6 PM EST for either $9.50 or $10, depending on the shade. You can find out more about Noodles Nail Polish on their website, Instagram page, Facebook page, and Facebook Fan Group.